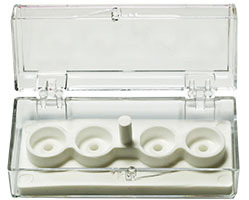 EM-Tec SJ4 clear styrene box with 4 storage positions for Ø9.5mm JEOL cylinder stubs. The stubs are held in the cavities of the LDPE insert. Post in the middle of the insert keeps the samples clear of the lid. Suitable for both the 5 and 10mm height and angled cylinder stubs. Maximum sample height is 4 to 9mm, depending on stub height. 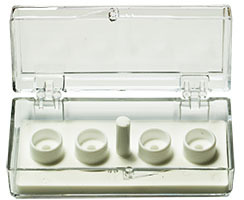 EM-Tec SJ5 clear styrene box with 4 storage positions for Ø12.2mm JEOL cylinder stubs. The stubs are held in the cavities of the LDPE insert. Post in the middle of the insert keeps the samples clear of the lid. Suitable for both the 5 and 10mm height and angled cylinder stubs. Maximum sample height is 4 to 9mm, depending on stub height. EM-Tec SC12 clear combi styrene box with 12 storage positions for either Ø9.5mm or Ø12.2mm JEOL cylinder stubs. The stubs are held in the cavities of the LDPE insert. Post in the middle of the insert keeps the samples clear of the lid. 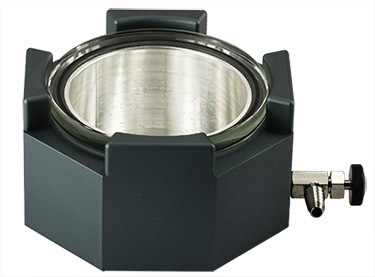 Suitable for both the 5 and 10mm height and angled cylinder stubs. Maximum sample height is 4 to 9mm, depending on stub height. Alternatively, the EM-Tec SC12 storage box can also be used for standard pin stubs.